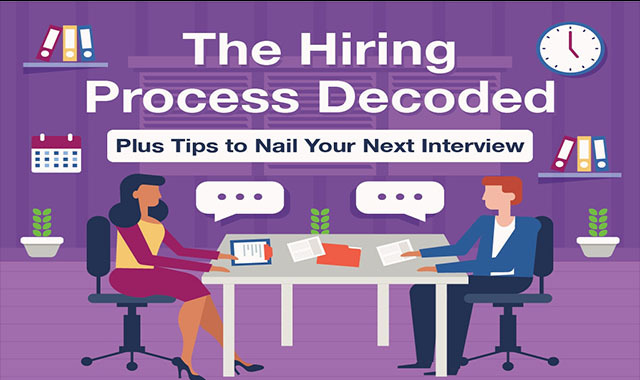 The hiring process decoded: Plus tips to nail your next interview #infographic ~ Visualistan '+g+"
The average corporate job opening attracts 250 resumes. And of these candidates, only four to six will be called in for an interview. So if you land that interview, how can you help ensure you remain a top candidate? Beyond getting there early and dressing right, there are strategies you can take to show you’re a professional, prepared, and knowledgeable applicant. For instance, you can stay up to date with company and industry news by setting up Google alerts with the company’s name and any relevant industry search terms. You can also create a cheat sheet that lists career successes and accomplishments that you didn’t include on your resume. Read on for more helpful tips to help you feel confident and in control at your next job interview.